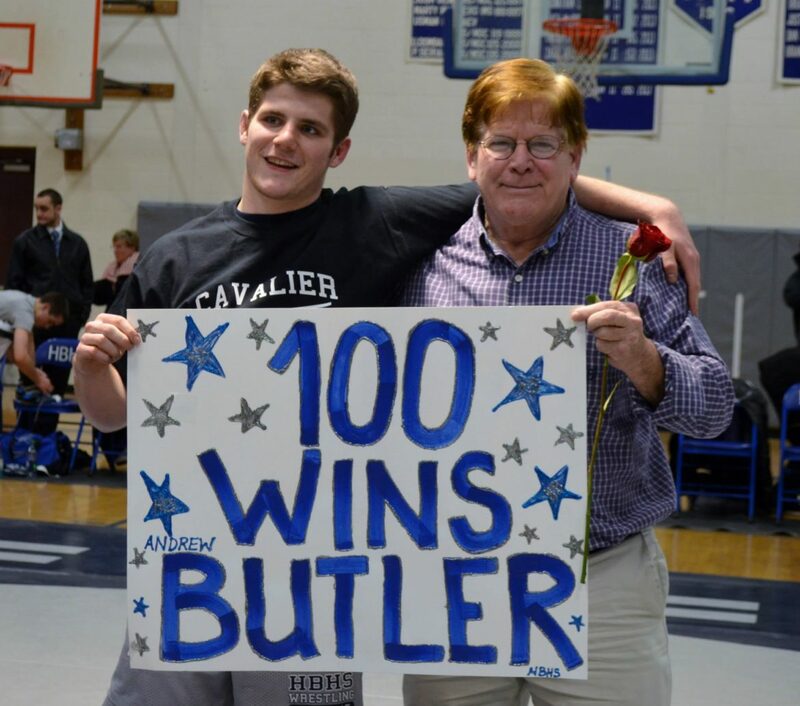 Andrew Butler, left, is pictured at Hollis High School in February 2015 with his father Douglas Butler. Andrew excelled in wrestling and football. Update: On Thursday shortly before noon, the NH House voted 183-158 against a Senate amendment that would have changed HB 1565. The bill as it stands now requires the Department of Corrections to seek to have the Secure Psychiatric Unit accredited as a psychiatric hospital. The state’s position that a 1986 Supreme Court ruling allows locking up mentally ill people who haven’t committed a crime in the Secure Psychiatric Unit at the men’s prison in Concord is being challenged by attorneys and advocates. The practice – which is unique to New Hampshire – caused an uproar in Hollis recently after townspeople learned that Andrew Butler, 21, a popular former high school star athlete has been held at the prison psychiatric unit since last fall even though he isn’t charged with or been convicted of a crime. Associate Attorney General Anne Edwards says a 1986 ruling in the Dana Champagne case shows it passes constitutional muster to commingle criminal and non-criminal mentally ill patients at the men’s prison. “The State believes that the Champagne case allows civil committees to be treated at the SPU,” Edwards said. She declined to comment on the Butler case. Veteran defense attorney Paul Twomey insists the state Supreme Court’s decision focused only on treatment at the unit. It didn’t address whether it is constitutional to incarcerate someone there who hasn’t committed a crime, Twomey said. “What the court specifically didn’t reach in the Champagne case was the due process question – is it fundamentally fair to keep someone in a prison setting when they have committed no crime. The court didn’t reach the question in that case,” Twomey said. Twomey, who has represented people who have been incarcerated in the state prison and its Secure Psychiatric Unit over the years, said it is simply wrong to keep people locked up in prison for being mentally ill.
Mentally ill people are transferred there from the New Hampshire Hospital, the state’s psychiatric hospital, if they are deemed a danger to themselves or others and can’t safely be housed at the psychiatric hospital. They are then housed with mentally ill people who have been convicted of crimes and others who have been deemed not competent to stand trial and found not guilty by reason of insanity. “Keeping sick people who haven’t committed a crime locked up at SPU (Secure Psychiatric Unit) is shameful,” Twomey said. Dana Champagne was deemed incompetent to stand trial in the murder of his parents and sent to the Secure Psychiatric Unit. The due process question is at the heart of a writ filed two weeks ago in federal court by Andrew Butler’s attorney Sandra Bloomenthal demanding he be immediately moved out of the prison because he hasn’t committed a crime. Butler has been assigned a prisoner number without being convicted of a crime and needs mental health care not imprisonment, Bloomenthal wrote. A structuring hearing in Andrew Butler’s case has been scheduled for May 24 in U.S. District Court in Concord. The state hasn’t filed a response yet. Rep. Renny Cushing, D-Hampton, has led the charge against commingling the non-criminal and criminal patients at the Secure Psychiatric unit. A piece of legislation Cushing sponsored to require the Secure Psychiatric Unit be accredited as a psychiatric hospital is expected to be heard in the House today (Thursday). House Bill 1565 was amended in the Senate last week to allow the Department of Corrections to seek prison accreditation of the unit instead, but Cushing hopes that amendment will be reversed. Update: On Thursday just before noon, the House voted 183-158 against the Senate amendment so the bill now requires the Department of Corrections to seek to have the Secure Psychiatric Unit accredited as a psychiatric hospital. It will now go to a committee of conference. Andrew Butler’s father, Douglas Butler, said his son was a terrific student who went on to Worcester Polytechnic Institute before having problems last summer. His son had some interactions with Hollis police because of his recent mental health issues, but any criminal charges were dropped, Butler said. Andrew would run from police because he was frightened, Butler said. Butler believes his son had a bad reaction while experimenting with illegal drugs during a visit to Vermont last summer. He also believes the drugs his son is now prescribed make him worse, but he has no input on his son’s medication because the state removed him as Andrew’s guardian, Butler said. “He’s well respected and loved,” Butler said, adding Andrew is heartened by the support shown him from the people of Hollis who have raised money for his defense. More than 1,000 people have signed a petition to free Andrew. Coulter became an advocate for mentally ill people and an outspoken critic of the Secure Psychiatric Unit after working there for only a few days. She and Wanda Duryea co-founded Advocates for Ethical Mental Health Treatment. Avard mentioned Andrew Butler on the Senate floor while discussing HB 1565 last week. “Mental illness is not a crime and those who suffer from it need better treatment and should not be treated as a criminal,” Avard said.